It is an article of belief with some old-fashioned people that children should have no secrets from their parents, and, though not a model father in every way, Mr. Vickers felt keenly the fact that his daughter was keeping something from him. On two or three occasions since the date of sailing of the Fair Emily she had relieved her mind by throwing out dark hints of future prosperity, and there was no doubt that, somewhere in the house, she had a hidden store of gold. With his left foot glued to the floor he had helped her look for a sovereign one day which had rolled from her purse, and twice she had taken her mother on expensive journeys to Tollminster. Brooding over the lack of confidence displayed by Selina, he sat on the side of her bed one afternoon glancing thoughtfully round the room. He was alone in the house, and now, or never, was his opportunity. After an hour's arduous toil he had earned tenpence-halfpenny, and, rightly considering that the sum was unworthy of the risk, put it back where he had found it, and sat down gloomily to peruse a paper which he had found secreted at the bottom of her box. Mr. Vickers was but a poor scholar, and the handwriting was deplorable. Undotted "i's" travelled incognito through the scrawl, and uncrossed "t's" passed themselves off unblushingly as "l's." After half an hour's steady work, his imagination excited by one or two words which he had managed to decipher, he abandoned the task in despair, and stood moodily looking out of the window. His gaze fell upon Mr. William Russell, standing on the curb nearly opposite, with his hands thrust deep in his trouser-pockets, and, after a slight hesitation, he pushed open the small casement and beckoned him in. Again Mr. Vickers hesitated, but he had no choice, and his curiosity would brook no delay. With a strong caution as to secrecy, he handed the paper over to his friend. Mr. Russell, his brow corrugated with thought, began to read slowly to himself. The writing was certainly difficult, but the watching Mr. Vickers saw by the way his friend's finger moved along the lines that he was conquering it. By the slow but steady dilation of Mr. Russell's eyes and the gradual opening of his mouth, he also saw that the contents were occasioning him considerable surprise. Mr. Russell paid no heed. He gave vent to a little gurgle of astonishment and went on. Then he stopped and looked up blankly. "Well, I'm d—-d!" he said. Mr. Russell read on, and such exclamations as "Well, I'm jiggered!" "Well, I'm blest!" and others of a more complicated nature continued to issue from his lips. Mr. Russell looked up and blinked at him. "I can't believe it," he murmured. "It's like a fairy tale, ain't it? What do you think of it?" The exasperated Mr. Vickers, thrusting him back in his chair, shouted insults in his ear until his friend, awaking to the true position of affairs, turned to the beginning again and proceeded with much unction to read aloud the document that Mr. Tredgold had given to Selina some months before. Mr. Vickers listened in a state of amazement which surpassed his friend's, and, the reading finished, besought him to go over it again. Mr. Russell complied, and having got to the end put the paper down and gazed enviously at his friend. "Not if I 'ad my rights," said Mr. Vickers. "It's like a dream, ain't it?" "They bought a ship, so I 'eard," murmured the other; "they've got eight or nine men aboard, and they'll be away pretty near a year. Why, Selina'll 'ave a fortune." Mr. Vickers, sitting with his legs stretched out stiffly before him, tried to think. "A lot o' good it'll do me," he said, bitterly. "It's young Joseph Tasker that'll get the benefit of it." Mr. Russell whistled. "I'd forgot him," he exclaimed, "but I expect she only took him becos she couldn't get anybody else." Mr. Vickers eyed him sternly, but, reflecting that Selina was well able to fight her own battles, forbore to reply. "She must ha' told him," pursued Mr. Russell, following up a train of thought. "Nobody in their senses would want to marry Selina for anything else." "Unless they was mad," admitted the other. "What are you going to do about it?" he inquired, suddenly. "I shall think it over," said Mr. Vickers, with dignity. "As soon as you've gone I shall sit down with a quiet pipe and see what's best to be done." Mr. Russell nodded approval. "First thing you do, you put the paper back where you got it from," he said, warningly. "I know what I'm about," said Mr. Vickers. "I shall think it over when you're gone and make up my mind what to do." "Don't you do nothing in a hurry," advised Mr. Russell, earnestly. "I'm going to think it, over, too." "Yes, me," replied the other. "After all, what's looks? Looks ain't everything." His friend looked bewildered, and then started furiously as the meaning of Mr. Russell's remark dawned upon him. He began to feel like a miser beset by thieves. "I'm as old as I look," replied Mr. Russell, simply, "and I've got a young face. I'd sooner it was anybody else than Selina; but, still, you can't 'ave everything. If she don't take me sooner than young Joseph I shall be surprised." "I might ha' married scores o' times if I'd liked," said Mr. Russell, with a satisfied air. "Don't you go doing nothing silly," said Mr. Vickers, uneasily. "Selina can't abear you. You drink too much. Why, she's talking about making young Joseph sign the pledge, to keep'im steady." Mr. Russell waved his objections aside. "I can get round her," he said, with cheery confidence. "I ain't kept ferrets all these years for nothing. I'm not going to let all that money slip through my fingers for want of a little trying." He began his courtship a few days afterwards in a fashion which rendered Mr. Vickers almost helpless with indignation. In full view of Selina, who happened to be standing by the door, he brought her unfortunate father along Mint Street, holding him by the arm and addressing him in fond but severe tones on the surpassing merits of total abstinence and the folly of wasting his children's money on beer. "I found 'im inside the 'Horse and Groom,"' he said to the astonished Selina; "they've got a new barmaid there, and the pore gal wasn't in the house 'arf an hour afore she was serving him with beer. A pot, mind you." He shook his head in great regret at the speechless Mr. Vickers, and, pushing him inside the house, followed close behind. "Look here, Bill Russell, I don't want any of your larks," said Miss Vickers, recovering herself. "Larks?" repeated Mr. Russell, with an injured air. "I'm a teetotaler, and it's my duty to look after brothers that go astray." He produced a pledge-card from his waistcoat-pocket and, smoothing it out on the table, pointed with great pride to his signature. The date of the document lay under the ban of his little finger. "I'd just left the Temperance Hall," continued the zealot. "I've been to three meetings in two days; they'd been talking about the new barmaid, and I guessed at once what brother Vickers would do, an' I rushed off, just in the middle of brother Humphrey's experiences—and very interesting they was, too—to save him. He was just starting his second pot, and singing in between, when I rushed in and took the beer away from him and threw it on the floor." "I wasn't singing," snarled Mr. Vickers, endeavouring to avoid his daughter's eye. "Oh, my dear friend!" said Mr. Russell, who had made extraordinary progress in temperance rhetoric in a very limited time, "that's what comes o' the drink; it steals away your memory." Miss Vickers trembled with wrath. "How dare you go into public-houses after I told you not to?" she demanded, stamping her foot. "We must 'ave patience," said Mr. Russell, gently. "We must show the backslider 'ow much happier he would be without it. I'll 'elp you watch him." "When I want your assistance I'll ask you for it," said Miss Vickers, tartly. "What do you mean by shoving your nose into other people's affairs?" "It's—it's my duty to look after fallen brothers," said Mr. Russell, somewhat taken aback. "What d'ye mean by fallen?" snapped Miss Vickers, confronting him fiercely. "Fallen into a pub," explained Mr. Russell, hastily; "anybody might fall through them swing-doors; they're made like that o' purpose." "You've fell through a good many in your time," interposed Mr. Vickers, with great bitterness. "I know I 'ave," said the other, sadly; "but never no more. Oh, my friend, if you only knew how 'appy I feel since I've give up the drink! If you only knew what it was to 'ave your own self-respeck! Think of standing up on the platform and giving of your experiences! But I don't despair, brother; I'll have you afore I've done with you." Mr. Vickers, unable to contain himself, got up and walked about the room. Mr. Russell, with a smile charged with brotherly love, drew a blank pledge-card from his pocket and, detaining him as he passed, besought him to sign it. "He'll do it in time," he said in a loud whisper to Selina, as his victim broke loose. "I'll come in of an evening and talk to him till he does sign." Miss Vickers hesitated, but, observing the striking improvement in the visitor's attire effected by temperance, allowed a curt refusal to remain unspoken. Mr. Vickers protested hotly. "That'll do," said his daughter, indecision vanishing at sight of her father's opposition; "if Bill Russell likes to come in and try and do you good, he can." Mr. Vickers said that he wouldn't have him, but under compulsion stayed indoors the following evening, while Mr. Russell, by means of coloured diagrams, cheerfully lent by his new friends, tried to show him the inroads made by drink upon the human frame. He sat, as Miss Vickers remarked, like a wooden image, and was only moved to animation by a picture of cirrhosis of the liver, which he described as being very pretty. At the end of a week Mr. Vickers's principles remained unshaken, and so far Mr. Russell had made not the slightest progress in his designs upon the affections of Selina. That lady, indeed, treated him with but scant courtesy, and on two occasions had left him to visit Mr. Tasker; Mr. Vickers's undisguised amusement at such times being hard to bear. "Don't give up, Bill," he said, encouragingly, as Mr. Russell sat glum and silent; "read over them beautiful 'Verses to a Tea-pot' agin, and try and read them as if you 'adn't got your mouth full o' fish-bait. You're wasting time." "I don't want none o' your talk," said his disappointed friend. "If you ain't careful I'll tell Selina about you going up to her papers." The smile faded from Mr. Vickers's face. "Don't make mischief, Bill," he said, uneasily. "Well, don't you try and make fun o' me," said Mr. Russell, ferociously. "Taking the pledge is 'ard enough to bear without having remarks from you." "I didn't mean them to be remarks, Bill," said the other, mildly. "But if you tell about me, you know, Selina'll see through your little game." "I'm about sick o' the whole thing," said Mr. Russell, desperately. "I ain't 'ad a drink outside o' my own house for pretty near a fortnight. I shall ask Selina to-morrow night, and settle it." Mr. Vickers, thoroughly alarmed, argued with him in vain, the utmost concession he could wring from the determined Mr. Russell being a promise to give him a hint to get out of the way. "I'll do that for my own sake," he said, frankly. "I can do it better alone, and if your old woman is in you get her out too. Ask 'er to go for a walk; that'll please Selina. I don't know what the gal does want. I thought turning teetotaler and setting a good example to you would do the trick, if anything would." Mrs. Vickers's utter astonishment next evening, when her husband asked her to go for a walk, irritated that gentleman almost beyond endurance. Convinced at last that he was not joking, she went upstairs and put on her bonnet, and then stood waiting for the reluctant Mr. Vickers with an air of almost bashful diffidence. "Joseph is coming in soon," said Selina, as her parents moved to the door. "I'm expecting him every minute." "I'll stop and see 'im," said Mr. Russell. "There's something I want to speak to him about partikler." Mr. Vickers gave a warning glance at him as he went out, and trembled as he noted his determined aspect. In a state of considerable agitation he took hold of his wife by the elbow and propelled her along. It was a cold night, and a strong easterly wind had driven nearly everybody else indoors. Mr. Vickers shivered, and, moving at a good pace, muttered something to his astonished wife about "a good country walk." They quitted the streets and plunged into dark lanes until, in Mr. Vickers's judgment, sufficient time having elapsed for the worst to have happened, they turned and made their way to the town again. "There's somebody outside our house," said Mrs. Vickers, who had been in a state of amazed discomfort the whole time. Mr. Vickers approached warily. Two people were on the doorstep in the attitude of listeners, while a third was making strenuous attempts to peep through at the side of the window-blind. From inside came the sound of voices raised in dispute, that of Selina's being easily distinguishable. "What—what's all this?" demanded Mr. Vickers, in trembling tones, as he followed his wife inside and closed the door. 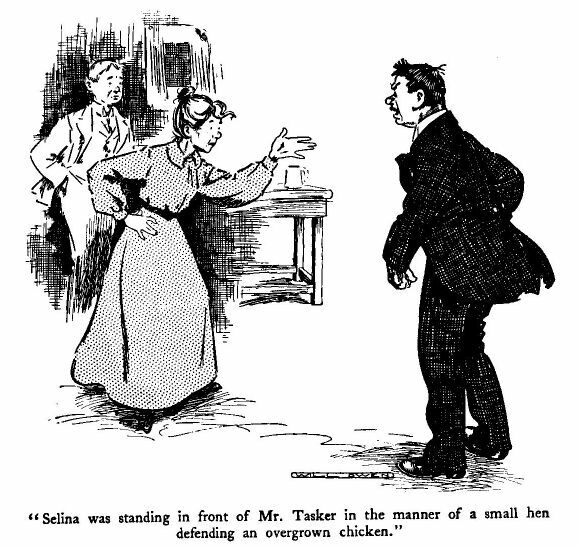 He glanced from Selina, who was standing in front of Mr. Tasker in the manner of a small hen defending an overgrown chicken, to Mr. Russell, who was towering above them and trying to reach him. The disputants all spoke at once: Mr. Russell with an air of jocular ferocity, Miss Vickers in a voice that trembled with passion, and Mr. Tasker speaking as a man with a grievance. Despite the confusion, Mr. Vickers soon learned that it was a case of "two's company and three's none," and that Mr. Russell, after turning a deaf ear to hints to retire which had gradually increased in bluntness, had suddenly turned restive and called Mr. Tasker a "mouldy image," a "wall-eyed rabbit," and divers other obscure and contradictory things. 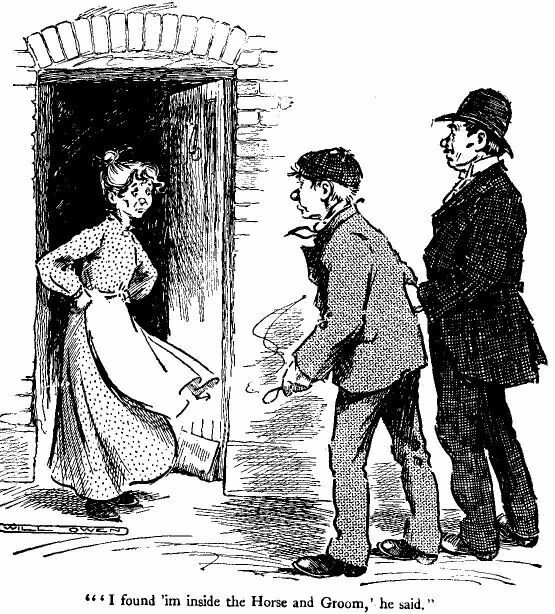 Not content with that, he had, without any warning, kissed Miss Vickers, and when Mr. Tasker, obeying that infuriated damsel's commands, tried to show him the door, had facetiously offered to show that gentleman the wall and taken him up, and bumped him against it until they were both tired. "Anybody would ha' thought I was hurting 'im by the noise he made," said the impenitent Mr. Russell. "I—I'm surprised at you, Bill," said Mr. Vickers, nervously. "You'd better get off 'ome, Bill," said Mr. Vickers, with a persuasive wink. "Go and get yourself 'arf a pint o' warm lemonade," chimed in the voice of the daring Joseph. Mr. Russell stepped towards him, but Mr. Vickers, seizing him by the coat, held him back and implored him to remember where he was. "I'd bump the lot of you for two pins," said the disappointed Mr. Russell, longingly. "And it'ud do you good; you'd all be the better for it. You'd know 'ow to behave to people when they come in to see you, then. As for Selina, I wouldn't marry her now for all her money." "The money in the paper," said Mr. Russell, with a diabolical leer in the direction of the unfortunate Mr. Vickers. "The paper what your father found in your box. Didn't he tell you?" He kicked over a chair which stood in his way and, with a reckless swagger, strode to the door. At the "Horse and Groom," where he spent the remainder of the evening, he was so original in his remarks upon women that two unmarried men offered to fight him, and were only appeased by hearing a full and true account of the circumstances responsible for so much bitterness.